Nothing's going to keep this man from the Oval Office, no matter the reviews. A decent movie about some of the nastiest actions of some of the nastiest people of that time. It was a little long but what can you do, there was so much to say. All of the "good guys" in this movie did a great job. But, it really is Cranston's movie and boy what a job of it he did. This is definitely movie you should not miss. Brian Cranston does an outstanding job of portraying Dalton Trumbo during one the most shameful eras of the 20th century. The quality of this film is such that it feels as though you were there when the insanity of the Red Scare gripped our nation. The lives ruined and damage caused to innocent families is heart wrenching. A cautionary tale for those who would have us repeat those horrible events. 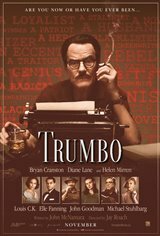 Brian Cranston does an outstanding job of portraying Dalton Trumbo and his life during one the most shameful eras of the 20th century. The quality of this film is such that it feels as though you were there when the insanity of the Red Scare gripped our nation. The lives ruined and damaged caused to innocent families is heart wrenching. A cautionary tale for those who would have us repeat these horrible events. This is a well done movie but it's another shameful Hollywood work of fiction and a re-write of history. Trumbo wasn't a poor put-upon family man trying to do good. He was in fact a nasty and active Soviet stooge working to harm his country. The story is real and riveting. Cranston and Mirren were amazing. Some icons were tarnished, new ones rose. You may spend much of the movie wondering what you would have been capable of doing if you were in their shoes. Excellent film about a film maker with very USian ideology: the right to think freely. Why does Hollywood continue to make these films which promote an alien totalitarian ideology ? Something is wrong here !